You are here: Home / Why Apply for a VA Home Loan? 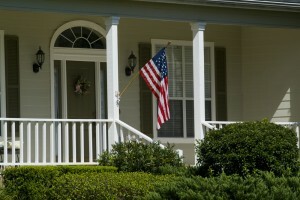 If you qualify, there are many reasons to apply for a VA Home Loan. For most veterans, it makes no sense to choose any other type of loan. But let us first get a better idea of what a VA Loan is and discuss some of the misconceptions about them. The United States Department of Veterans Affairs is not actually the one making the loan. VA guaranteed home loans can be made by most lending institution such as banks or mortgage brokers. A common misconception is the term “guaranteed.” A Veteran is not “guaranteed” to get a home loan. The VA is “guaranteeing” the loan to the lender, which means that if the veteran can not make their loan payments the VA will make sure that the lender that actually financed the house is insured against loss. The VA is essentially giving the lender an insurance policy in case the Veteran can not make his/her payments. In today’s world this is a VERY attractive offer for a lender and it works out in the Veterans favor. Because the lender knows the loan is now guaranteed by the VA they can offer substantial benefits to the Veteran. USVA Realty has partner lenders that will help to get your VA home loan pre-approval in a few hours. Purchase with $0 down. Other loan types require as much as 20% down. Lower interest rates, typically 0.5% to 1.0%. This could save you tens of thousands of dollars over the length of the loan. You don’t have to buy private mortgage insurance (PMI.) The VA is already insuring “guaranteeing” the loan for you. Getting qualified is much easier. Because the loan is insured by the federal government, lenders are not as strict with the lending rules. You can not be penalized for paying your loan off early. The closing costs may be paid by the seller of the home. Ask your Realtor about this. The VA may be able to help you if you have difficulty making payments. If you are a disabled veteran with a service related disability of at least 10% you may qualify to have the VA funding fee waived. Furthermore, most states even have laws that waive property taxes for disabled veterans.